I lost my brother last week. My mom died when I was nine and I went to live with my dad and stepmom. Shortly after that, I became a big sister. My parents divorced, I graduated high school, and went to live with my Aunt Kathy. In 1994, my stepmom passed away. So, I’m 28 years old and O for 2 in the mom department. In 2001, a mere couple of weeks after the 9/11 tragedy, I flew to Colorado for a court date. I was 35 years old at the time, married with two teenagers. My mom’s sister, my Aunt Kathy, had made arrangements to adopt me. As an adult. It’s a thing. You can look it up. When the judge ruled, he told me that she must love me very much. Indeed. It hasn’t always been easy, getting a mom when you’re a grown up. I went most of my life without a mom. Heck, I was the mom by then! With my new mother, came two siblings. Affectionately called my cousin-brothers, there was Troy, who is my age (almost exactly–less than a month separates our birthdays), with whom I lived after graduation for the two years before I got married. And Kerry, five years older (almost to the day, our birth dates are 2 days apart), who was well established in his grown up life in Arizona. Kathy had asked her sons if they were okay with her adopting me. They were. I was welcomed into their sibling fold. I went from cuz to sis. 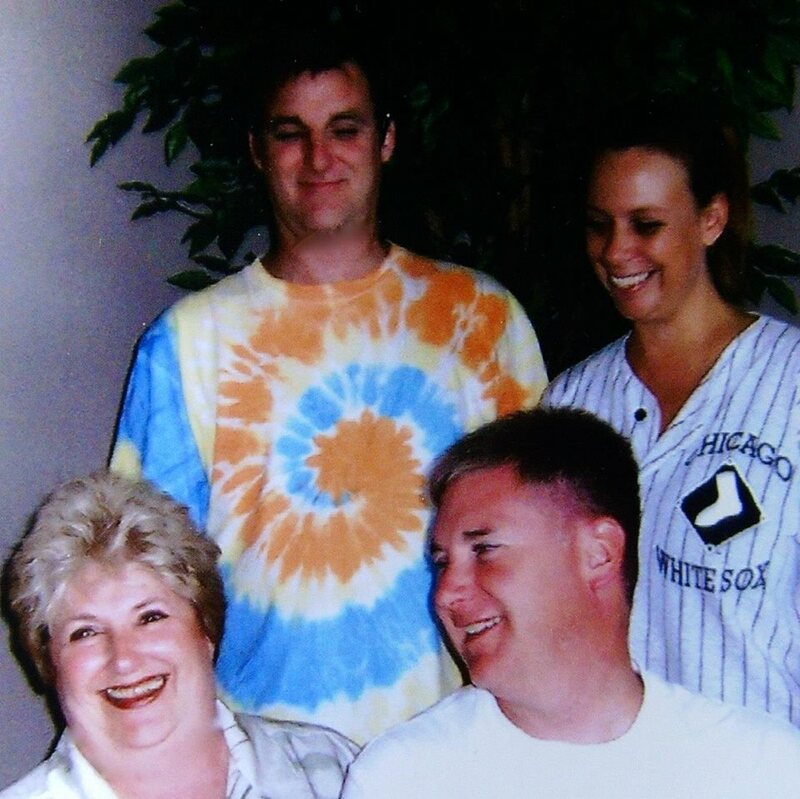 Fun fact: Kerry’s kids and mine alternate birth years: Katrina – 12/85, Nicole – 11/86, Kollin – 11/87, and Zach – 11/88. But with the exception of childhood holiday memories, Kerry’s wedding, a memorable family boat trip, and the occasional “back home” visit, I didn’t really know him. He was doing his thing half a nation away, I was doing my thing here, our things rarely intersected. * He listened to Cheech and Chong albums in the 70’s. Good morning class. Class? Class! * He looked like Kenny Loggins. For all of the 80’s and most of the 90’s, probably longer, but after a couple of decades, people were like, who is Kenny Loggins? * He had an FU tattoo on his forearm. A 4″ green fuzzball flipping you off. I imagine he presented quite the dichotomy whenever he rolled up his shirt sleeves to get down to work as an Aircraft Mechanical/Structural Tech. V at Boeing. * He was the superhero of Lake Powell when the sand storm blew in, the jet ski broke loose, and he leapt from the slippery, writhing deck to the slippery, writhing Sea Doo to safely retrieve it. * He was diagnosed eighteen months ago with a cancer that usually devours its prey in weeks. Take that you cancer bastards. I cry for all the things he won’t experience, 56 is too young. I cry for his mother, who is my mother, no parent should ever outlive their child. I cry for his brother, who is my brother, and as the younger of the two has never experienced life without Kerry. I cry for his children, who are my niece and nephew, and although adults, have lost their Daddy. I cry for his grandson, Riley, born in time to meet his grandfather, but who will know him only through stories and photos. I cry for his wife, because I am a wife, and I can’t imagine losing my spouse. I cry for his father who was with him at the end. In celebration of a life well-lived. He jumped out of airplanes! For fun! He was a hard worker, smart, and funny–even to the end, and I was lucky to have him as a brother. It’s because the love is so strong that the loss is so great. I will miss you, Kerry. I will make an effort to be closer to my other brother and my sister. Sometimes we get so caught up with our own thread, we forget to weave. Hug your people today, okay? This entry was posted in It's all about me, It's all about You and tagged adult adoption, Boeing, Cheech and Chong, cousin-brother, Kenny Loggins, Kerry Vail, Lake Powell, Mary Lamphere, Rest in Peace my brother. Bookmark the permalink. Thank you, Kristin. No matter how long you expect the inevitable, you are never fully prepared for the loss. Such a touching tribute. So beautiful. I am so sorry for your loss. We never know what life will bring so take every day as a gift and live each day to the fullest.